Exercise plays an important part in the treatment plan helping to lengthen and strenghten muscles that are underperforming bringing the body into balance. 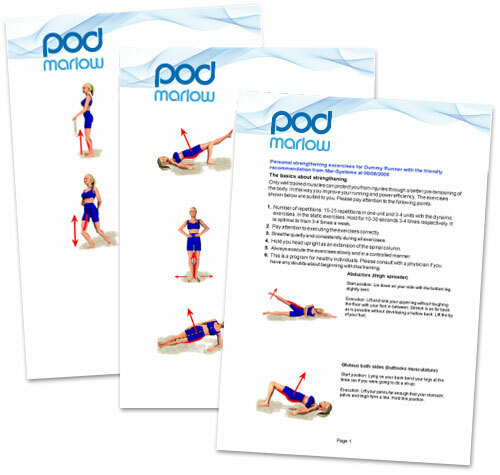 At pod marlow we have a programme of tried and tested exercises that target specific areas helping to isolate the muscles that require attention. We can devise exercise regimes suitable for all ages and abilities to ensure a structured and safe treatment of your condition whether you are a child, adult or an athlete. Additionally, our MotionQuest motion anaysis software programme produces a bespoke illustrated exercise schedule at the conclusion of your assessment. It is important to include these exercises on the prescribed basis, daily or weekly to ensure that you give your body the best chance to achieve comfort and optimum function.